The magic thing about Enlightened, the short-lived but beloved HBO series Mike White co-created with Laura Dern in 2011, is that it didn’t need to be timely to feel urgent. There was something relaxed about its woundedness, a gentle pace to its breakdowns and revelations. It was political, but in the way a “Coexist” bumper sticker is political. But for those who wish Enlightened had kept running all the way into the Trump era, White and director Miguel Arteta now bring us Beatriz at Dinner, a kind of dystopic sequel. While the central conflict remains the same — sage-burning touchy-feely types versus captains of industry — you can feel the current Zeitgeist congealing in the dark corners of an expansive Newport Beach estate where most of the action takes place, altering the molecular compound of the drama. This is a more anguished film than anything White has written recently, not least because current events can’t help but invade its already full emotional plate. Anchored by an enigmatic, elegiac performance by Salma Hayek, the film follows the titular holistic healer from her ramshackle Altadena house bursting with the barks and bleats of animals, to her job at a Santa Monica alternative cancer center, to, finally, the sprawling bluff-side Orange County home of a wealthy client (Connie Britton). Beatriz, a Mexican immigrant who came to California in the midst of harrowing circumstances, and Britton’s pampered, well-meaning housewife make for an odd pair, but White knows they’re by no means abnormal, and Arteta, Hayek, and Britton work together to establish the warm but incontrovertibly unequal dynamic between a wealthy white woman and the people she pays to make her life easier. Beatriz and Britton’s Cathy have known each other for years, but when Beatriz’s car breaks down, forcing her to stay at the house during an important dinner with Cathy’s husband’s business partners, there’s a palpable sense of a line of propriety being crossed for the first time. With her charming spirituality and occupational usefulness, Beatriz has always been welcome, but she’s never been a guest. As soon as she sees Cathy in her true milieu, a heavy sense of alienation blankets the film — class alienation, yes, but also moral alienation. Wandering around the house in her sensible khakis, Beatriz is quietly ignored by Cathy and her friends, while the male guests blithely ask her for top-offs on their drinks. As the sun sets over the Pacific, a chill sets over the film that never really goes away. The guest of honor is Doug Strutt (played with puckered pomposity by John Lithgow), a development tycoon who’s there to celebrate the green-lighting of yet another mall-hotel-entertainment complex. He’s the personification of a certain kind of all too familiar evil, crowing about his right to stomp on the poor and disenfranchised, laughing off hippie protesters, tossing around titles for his memoir. A few years ago, Doug might have seemed cartoonish and too easy a villain. But Beatriz at Dinner is preoccupied with a very specific question — “what would you do if you were at a dinner table with one of these guys?” — guys who, it now seems, are everywhere. For Beatriz, the question is even more charged because a direct connection she may or may not have to Strutt. But the thing that seems to shake Hayek’s Zen, makeup-free countenance more thoroughly is the realization that everyone in his orbit — including her dear old client — are at best blind to, and at worst complicit in, his greed and destruction. White’s created a microcosm where it’s easy to fit in as long as you’re only thinking about yourself, which feels all too familiar even for those of us who have never invited a Trump over for dinner. As Beatriz indulges in more wine, among other therapeutic aids, she starts to embrace her status as an outsider, as a kind of placid, shaming bell-ringer who won’t let these rich white people alone. 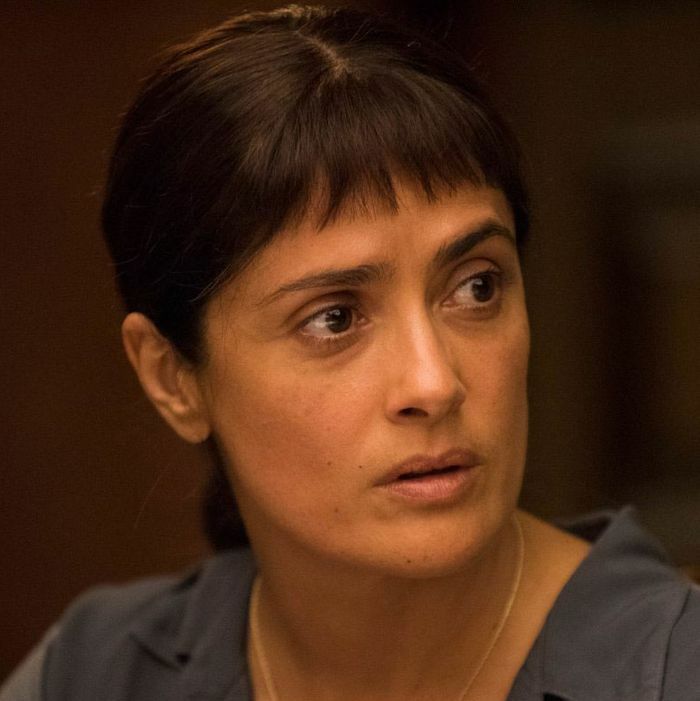 The way Hayek’s chosen to play this character — as a kind of haunted angel — lends itself to some surreal comic moments, but I left wanting Beatriz to be more than just a symbol. It’s harder to get inside her mind as the dynamic deteriorates and she realizes how drastic the stakes of the dinner are. But in the first half of the film, as she becomes more and more let down by the people around her, her performance is quietly shattering. The ambiguous ending will be infuriating for some, and while I didn’t need Arteta and White to go out with fireworks (that’s not really the mode they’re working in) something more character-driven might have felt more satisfying. There is such a wealth here, after all — not only with Hayek and Lithgow’s diametrically opposed figures, but in the superficially generous but blinkered Cathy, and Chloë Sevigny and Jay Duplass as a younger, careerist couple with at least a toe still on the side of decency. Beatriz at Dinner may not stick the landing, but its central clash between healers and destroyers maintains its choke hold long after the credits have rolled.